1) I am not accusing all white people of being racist. What I’m saying is that it’s far more prevalent than people realize or are willing to admit. 2) I currently live in the South, but in an area that has a huge “immigrant” population of people from New York, New Jersey, Pennsylvania, and other North/Northeastern states, so take that for what you will. 3) I understand the difference between someone making a joke (that’s a whole other debate entirely) and someone being serious. This is dedicated solely to those who are seriously racist, although they may not recognize it. 4) I’m merely attempting to point out the prejudice that I see within language and action. I also know that I’m not perfect and have my own biases to overcome; part of writing this is my attempt to overcome them. I want to let you in on a little secret; white people say some pretty racist things when you’re not around. Not all white people mind you, there are quite a few that honestly are not racist (at least not obviously so). There are many who are genuinely appalled when there is mistreatment of “minorities” anywhere, or when blatant racism happens to appear. Yet, there are others who aren’t so quick to come against racist actions. Yes, they quietly “tolerate” all these non-whites encroaching upon their existence and certainly don’t want to see violence done against non-whites, but they really don’t like you. I know this because I’m white and being white means other white people feel completely free to say whatever they’re thinking to me. After all, I’m safe, right? Now again, and I cannot stress this enough, there have been white people who have said the exact opposite of the above. They’ve shown genuine outrage towards the blatantly racist ongoings in this country, but more often than not there’s always a wink and a nudge when talking about non-whites when it’s just white people around. To be honest, I’m disgusted by it. It makes me feel uncomfortable, and most of my friends will tell you that it’s painfully obvious. But the fact is it still happens around me and, shamefully I admit, I don’t think I do enough to stop it. Especially when it was said to me as I was a bartender, because I was more concerned about my tips and job (which I most certainly would have lost if I spoke up) than I was about doing the right thing (admittedly shameful and wrong on my part). Of course, what’s the harm? If some white people hold a racist view, but never act it out, then who really cares? It’s not as though racial prejudice is getting anyone killed anymore, right? Well, see, that’s the problem; the racist attitudes that occur in private are inherently manifested in public, causing massive problems and even death (especially among young black men). 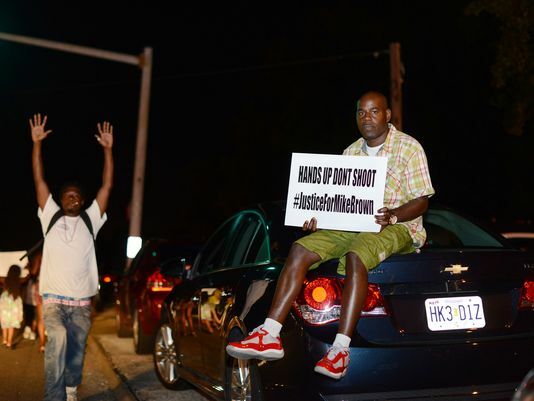 Think about Mike Brown and the witness (Dorian Johnson) to his murder. Two young black men stopped by a police officer. Why? Perhaps he was looking for a suspect and saw two black men, who just always conveniently fit the description of someone who’s wanted. The witness was so afraid of the police that he moved out of his apartment, and for good cause. As we’ve already seen, the Ferguson police aren’t afraid of roughing up journalists and violating First Amendment rights, so why would they be afraid of a little retribution? They’ve shown absolute tyranny in how they’ve handled the community. Yet, within the white community, the riots are looked upon as opportunistic and self-destructive. We look at the riots and go, “Well no wonder the police are acting this way!” We show absolutely no sympathy for the vast majority of protestors who have remained peaceful, yet have been met with teargas and rubber bullets. Why? Because let’s be honest; if one black man acts up, we green light the mistreatment of the entire race. For whatever reason, no one points out the fact that the community has suffered under the oppression of poverty, under a brutal police force, under false charges, random stops, random searches, mistreatment, and absolutely no relief from this treatment. The last time an authoritative government attempted to implement martial law on a bunch of white people, to impoverish them via taxation, to fire indiscriminately into a crowd, to brutalize, search, and seize white people’s property, a Revolution occurred and the United States was born. We talk about how absurd it is for “these people” to destroy their own property, all while creating a Tea Party named after an event where we destroyed our own property. We ignore that the white colonials, while rioting, burned the ship Peggy Stewart. We forget that Sam Adams led a mob in destroying businesses and property during a Stamp Act riot in 1765 in Boston. There’s a multitude of other stories. The point is, the colonials faced years of oppression (in some cases, not nearly as severe as what America’s black community has faced) and rioted, destroying their own property in the process. At the time, the majority of Colonials – loyal to the crown – looked upon the rioters as rebels who deserved the full force of the law. Today we look upon them as Founding Fathers. Now, I’m not trying to justify the riots, I’m merely putting it into perspective; it never crosses the minds of white people in conversations about riots that rioting and destroying property was how our nation was founded. It served as the preamble to a revolution, but more importantly it showed discontent and that the people were growing weary of being oppressed by a tyrant. The rioting in Ferguson, at least the theft, is obviously not the same. But riots in general ought to serve as a warning sign. The thing is, recent events have really made me consider my place in America as a white man, especially with white privilege. I hear the stories on television of how young black men talk about how they feel nothing but fear when police come around, or how they worry about if they’ll fit in, or if they’ll get shot just wearing a hoodie walking to get something to eat. And my mind drifts to my black friends. I think of them getting harassed by an officer. I think of them getting gunned down and the media attempting to make them look like a thug. I think of them getting accosted by some overly zealous neighborhood watch, all because they’re wearing a hoodie and are the minority in the neighborhood. I can never know the situation they’re in, but I can empathize, and I can know how I’d feel if something ever happened to them. Or what if they’re maced for doing nothing at all, just being in an area and being black? And that’s when I realize just how dangerous these private conversations between white people really are. See, when we have these conversations, when we wink and smile about what “they” are “really like,” we create a dangerous stereotype that holds fatal consequences. We create a mentality that a young black man in a hoodie is actually a thug who is here to rob you, so it’s best to be prepared to gun him down. We create the mentality that the young hispanic man struggling with English is actually an illegal immigrant, so it’s okay to treat him however you want. That Muslim is really a terrorist, so it’s quite alright if the FBI performs warrantless wiretaps on him, he’s not really a citizen. We help create an environment where non-whites are thug, which only becomes a self-fulfilling prophecy; the police officer, having grown up in this environment, stops an innocent black kid. A struggle ensues because the kid is innocent, yet being treated like a criminal (he has rights). A mistake happens, the bias kicks in, and the kid ends up dead. Life snuffed out, an entire future gone, and for what? Why? At a certain point in these conversations, we miss the fact that we’re talking about human beings. We forget that we’re talking about individuals who are no different than you and I and are only defined by their race because we continue to create barriers around their color. We forget that the Bible doesn’t talk about “To the white man first, and then to the black man,” but instead “to the Jew first and also to the Greek/Gentile.” We forget that black, white, brown, or whatever, we’re all the Gentile (well, unless you’re actually Jewish, then you’re the Jew). We forget that we all bleed red, that we’re all members of the human race, that we’re all capable of helping each other. We forget that an individual is an individual, and just as we don’t want to be associated with the KKK just because they’re white, many of our friends don’t want to be associated with gangs just because some gangs are black. Yet, the above simply isn’t enough. For too long, white Americans have looked at the tragedies of the past and taken a “mulligan” attitude to it. An attitude of, “Oops, sorry, our bad. So, let’s just try this again.” But we can’t “try again.” We need to realize that we still live in a system where black men are followed in stores. We live in a society where white privilege does exist, but that doesn’t mean that to be white is to be racist. It just means we have to be aware (and work against) a system/culture that tends to favor one race above the others. I mean, think about it, how often do we (white people) worry about being followed around when we walk into a store? That’s an experience I’ve never had to endure, but through my friends I became aware of it and find ways to challenge it (and even expose that bias in my own life).I’ve brought up the police, but they’re starting to be oppressive to everyone equally (not sure that’s progress), but the truth is black men are targeted by police at a higher rate than anyone else. That’s a fear white people don’t have to carry. 300 years of slavery, over 100 years of segregation, years of Jim Crow, housing inequality, income inequality, and mistreatment by the police. All of that creates a culture, defines a culture, that isn’t eradicated just because a president put a pen to paper, or because a majority panel of judges wrote an opinion. Racism is hatred, and hatred is a cancer within a society, and like all cancer you can’t just get rid of it overnight, it’s a process. So non-White America, I’m sorry. I’m sorry that I haven’t done enough to recognize my own biases, your struggles, or done enough to help eradicate the inequality still within our system. We, white people, need to realize that racism isn’t ended, especially when we say the things we say when it’s just us around. The most important thing white people can do is just to learn, ask questions, and realize that just because legalized segregation is over and we elected Barak Obama, it doesn’t mean racism has ended. Posted on August 13, 2014 August 13, 2014 by Joel	This entry was posted in Culture and tagged Christianity, Ferguson, Mike Brown, police, Racism. Bookmark the permalink. Judging by the comments I read across the social media landscape, racism is very much alive and well. To be fair, I believe Rule #8 of the internet is to never read the comment section.